NASCAR Sprint Cup Series star and 2010 Daytona 500 champion Jamie McMurray is enjoying the off-season by returning to his roots in karting. 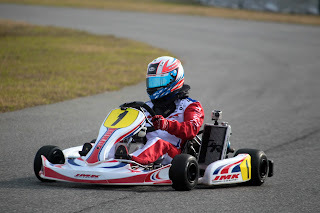 McMurray is among the entries participating in the annual Daytona KartWeek World Karting Association events at Daytona International Speedway. Practice began on Friday with races scheduled for Saturday and Sunday. 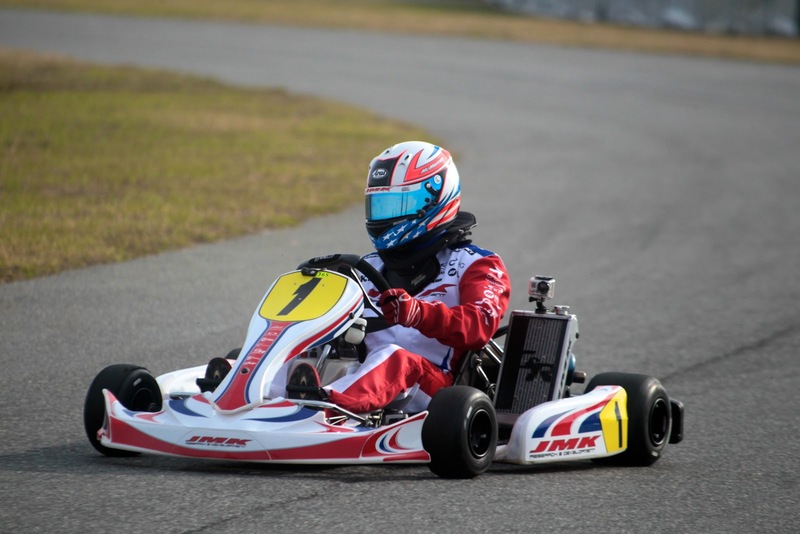 Hundreds of karters from across the country will spend their holidays at Daytona International Speedway participating in WKA races on three different courses – the 3.56-mile road course, the sprint track located in Turns 3 and 4 and the quarter-mile dirt track outside Turns 1 and 2. Tickets for Daytona KartWeek can be purchased at Ticket Booth E located above the Turn 1 tunnel near Williamson Boulevard. • A single-day passes is $15 (valid for Sunday, Dec. 30 only). Children ages seven and under are $20 for a three-day weekend pass, $15 for a two-day Saturday and Sunday pass, and $10 for a single-day Sunday pass. Mike Calinoff’s 140 BUZZ has announced expansions to its team. Amanda Wright joins 140 BUZZ as Client Services Manager and Cortney Dryden has been appointed Director of Digital Media. Learning her way around the NASCAR garage in 2010, Amanda Wright is recognized as one of the most endearing "Miss Sprint Cup" brand ambassadors. Stepping out of the firesuit, Wright hit the books and focused on a college education. 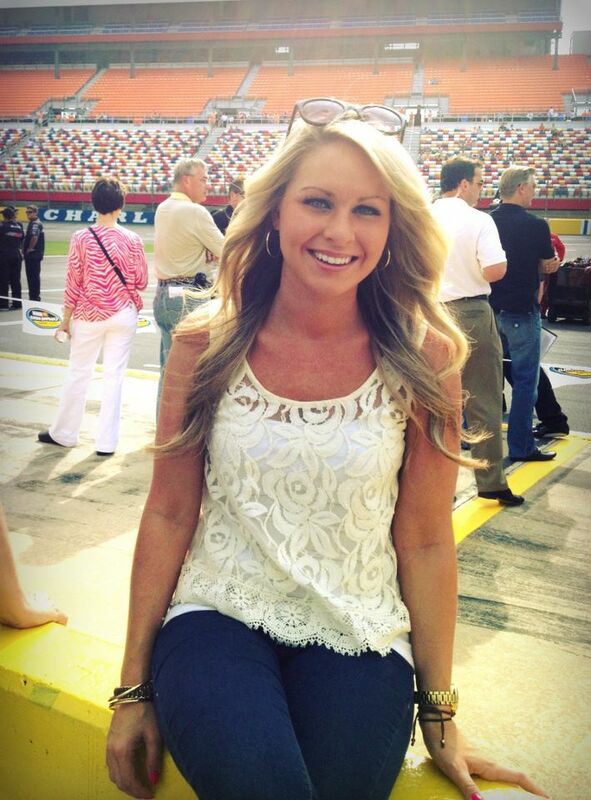 Graduating from The University of North Carolina at Charlotte in December 2012 with a degree in Marketing, Wright's knowledge of both NASCAR, Marketing and Social Media will be an asset to the 140 BUZZ team. Cortney Dryden has worked in NASCAR with RAB Racing for the past two years. With a talent and passion for all things digital, Dryden is expanding her experience both in and out of NASCAR since joining the team. Her work is featured on the new 140 BUZZ website, Calinoff's personal website and across all the company’s social media projects. On the management front, Amanda Ebersole has been promoted to Vice President of Operations. With the company since June, Amanda works hands-on with every client and development driver and prides herself in doing so. "This is a very exciting time for us," Calinoff said. "As we continue to grow, we're recruiting the best possible people to facilitate premier service for our clients. Both Amanda and Cortney will be great assets to our company." AT LAST! 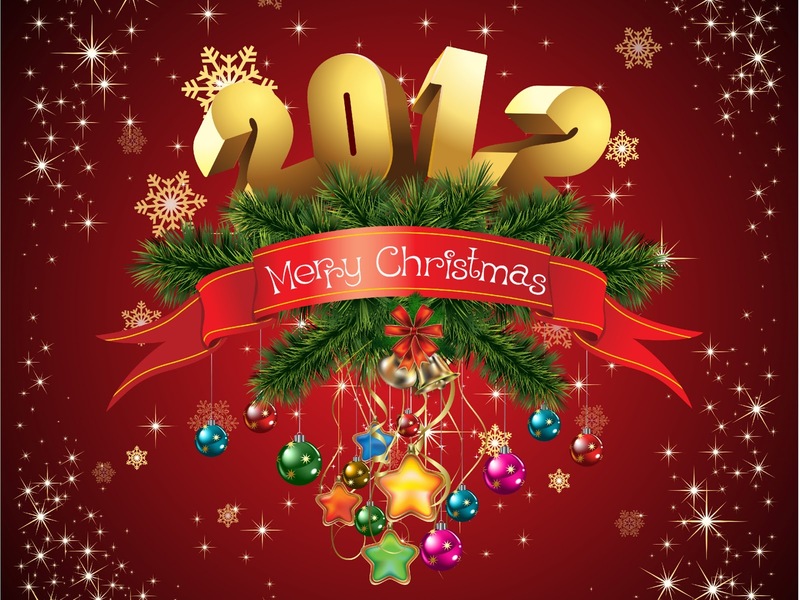 The 2012 Sirius XM Speedway "12 Days Of Christmas!" 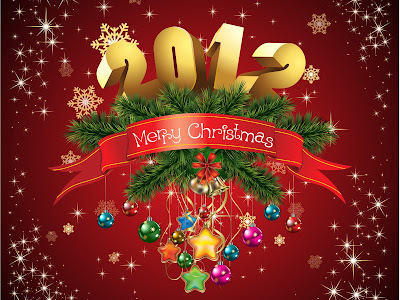 CLICK HERE to enjoy (we hope) the 2012 edition of our Sirius XM Speedway "12 Days Of Christmas!" 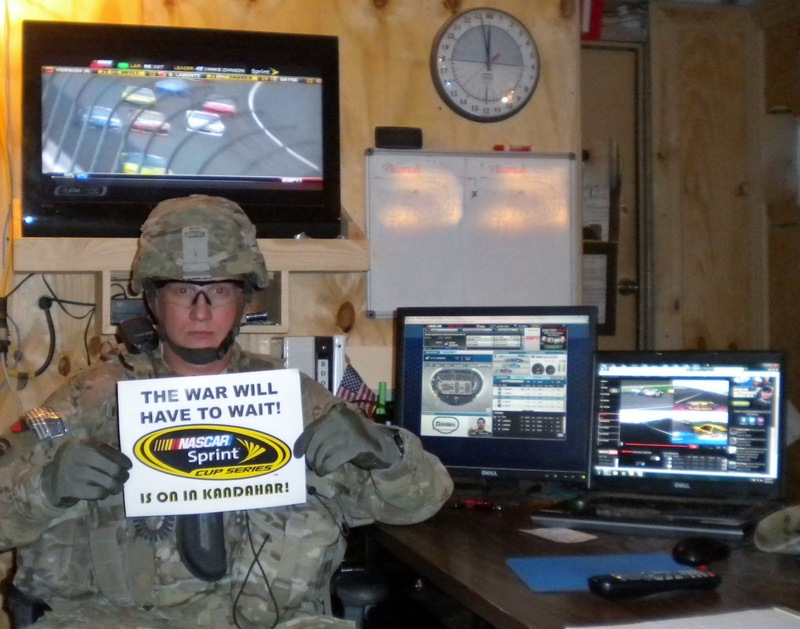 As a soldier in the United States Army deployed in Afghanistan, NASCAR fan Jason VanKleeck was some 7,700 miles from Daytona International Speedway when he watched this year’s season-opening Daytona 500 on television. He’ll be considerably closer to the action in 2013 as the Grand Prize winner in “The Great American Race Fan” Photo Contest, a joint promotion of the Motor Racing Network (MRN) and Daytona International Speedway (DIS). VanKleeck, a First Sergeant of the 287th Military Police Company from Fort Riley, Kan., submitted the winning entry. The photograph was taken in February 2012 as he watched the 54th running of the Daytona 500 from Kandahar Province. VanKleeck, who returns to the U.S. this month following his fourth combat tour in support of the global war on terrorism, gets the keys to a 2013 Chevrolet Camaro 2SS convertible as the Grand Prize winner. He’ll also receive a Daytona 500 VIP experience for two that includes grandstand tickets to the race, a tour of the NASCAR Sprint Cup Series garage and an introduction to the crowd during pre-race activities. To enter the contest, VanKleeck and others submitted photos showing what makes them the “greatest” and “most authentic” race fan to www.motorracingnetwork.com or www.daytonainternationalspeedway.com. Consumers also were able to enter the contest by visiting MRN and DIS Facebook pages. A committee comprised of staff from Motor Racing Network and Daytona International Speedway selected 10 finalists from among all contest entries. Internet voting was conducted from Nov. 9-30 and the winning entry was drawn earlier this month. For the fourth consecutive year, NASCAR’s biggest, richest and most prestigious race; the 55th annual Daytona 500 is scheduled for a 1 p.m. start time on Sunday, Feb. 24. The 51st anniversary Rolex 24 At Daytona GRAND-AM Rolex Sports Car Series race, Jan. 26-27, 3:30 p.m.
· The Lucas Oil 200 ARCA Racing Series, Saturday, Feb. 16, 4:30 p.m.
· The Daytona Shootout non-points event, Saturday, Feb. 16, 8 p.m.
· Daytona 500 Qualifying Presented By Kroger, Sunday, Feb. 17, 1 p.m.
· Budweiser Duel At Daytona, Thursday, Feb. 21, 2 p.m.
· NextEra Energy Resources 250 NASCAR Camping World Truck Series race, Friday, Feb. 22, 7:30 p.m.
· DRIVE4COPD 300 NASCAR Nationwide Series race, Saturday, Feb. 23, 1 p.m.
Penske Racing’s Brad Keselowski will begin his NASCAR Sprint Cup Series title defense in the season-opening 55th annual Daytona 500, which will mark the debut of the new 2013 NASCAR Sprint Cup Series car. Dubbed “Gen 6,” the new-look sixth generation cars highlight greater brand identity for the manufacturers. Matt Kenseth, who won the 2012 Daytona 500 with Roush Fenway Racing, will attempt to be the first driver since Sterling Marlin (1994-1995) to win “The Great American Race” for a second straight year with his new team Joe Gibbs Racing.Tickets for NASCAR’s biggest, richest and most prestigious race – the 55th annual Daytona 500 on Sunday, Feb. 24 – start at $65 and are available at www.daytonainternationalspeedway.com or by calling 1-800-PITSHOP. For the second straight year, the Speedway is offering special youth pricing for the Daytona 500. Children 12 and under will receive 50 percent off all backstretch grandstand seats for the Daytona 500 while supplies last. In addition, children 12 and under are free in the Sprint FANZONE throughout Budweiser Speedweeks. Kevin Harvick Foundation Awards "Happy's Chevy"
Christmas came early for one lucky winner on Thursday when Kevin Harvick handed over the keys to a brand-new 2012 Chevrolet Camaro 2SS convertible as part of "Win Happy's Chevy," proceeds from which benefit the Kevin Harvick Foundation. 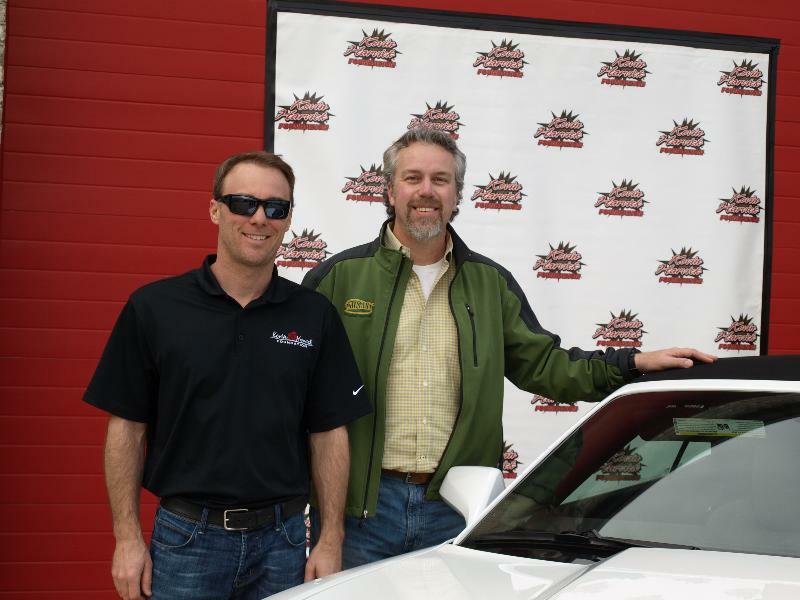 Michael Gatz, from Elkhorn, Wis., won the Camaro valued at $48,280, and drove it home from the Kevin Harvick Foundation's North Carolina headquarters. Gatz had purchased the winning ticket in the second-annual raffle for which nearly 2,500 tickets were sold at $29 each. Harvick drives the No. 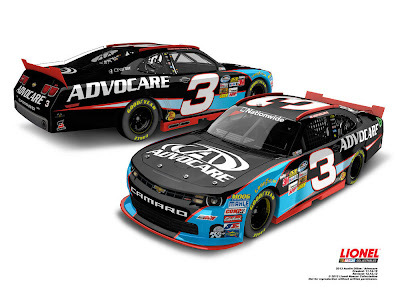 29 Richard Childress Racing Chevrolet in the NASCAR Sprint Cup Series. Proceeds from "Win Happy's Chevy" will be used to further the initiatives of the Kevin Harvick Foundation, whose mission is to enrich the lives of children across the country through programs such as Kevin's Krew, Chase Your Dreams Scholarships and the Kevin Harvick Athletic Scholarship Fund, among others. "I've driven my share of cool cars over the years, and the Chevrolet Camaro is one of my all-time favorites," Harvick said. "It is a powerful machine that personifies America's passion for fast cars. I am honored to partner with Chevrolet to not only play 'elf' and present Michael this dream car, but also to help many underprivileged children at the same time." Harvick hand-selected the vehicle's Summit White exterior and gray interior packages. The Camaro also features 21" black-painted aluminum wheels, six-speed manual transmission, V8 engine, high-intensity discharge headlamps with LED halo ring and much more. "Win Happy's Chevy" marks the final fundraiser of 2012 for the Kevin Harvick Foundation, founded in 2010 by Harvick and his wife, DeLana. This year's multi-pronged efforts raised valuable funds to assist underprivile ged children across the United States. 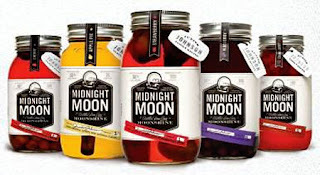 Fans headed to NASCAR Acceleration Weekend will have the opportunity to meet inaugural NASCAR Hall of Famer Johnson at Junior Johnson’s Midnight Moon Shine & Sign. 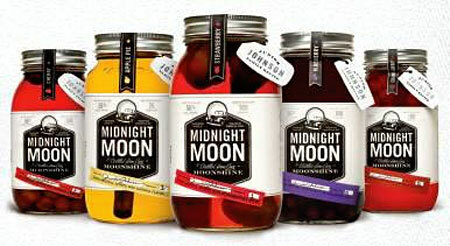 The new event will feature a fan Q&A and autograph session with Johnson and a free tasting at the Midnight Moon moonshine bar. All fans with a NASCAR Preview 2013 ticket will have free admission to the Shine & Sign, which will be held immediately following the NASCAR Preview on Saturday, Feb. 9 at the NASCAR Hall of Fame. Tickets are available now at www.nascaracceleration.com and the NASCAR Hall of Fame box office. A $20 ticket will gain fans all-day access into NASCAR Preview, the NASCAR Hall of Fame and Junior Johnson’s Midnight Moon Shine & Sign. NASCAR Preview 2013 is a fan festival featuring autographs and on-stage Q&A sessions with top drivers from all three NASCAR national series. 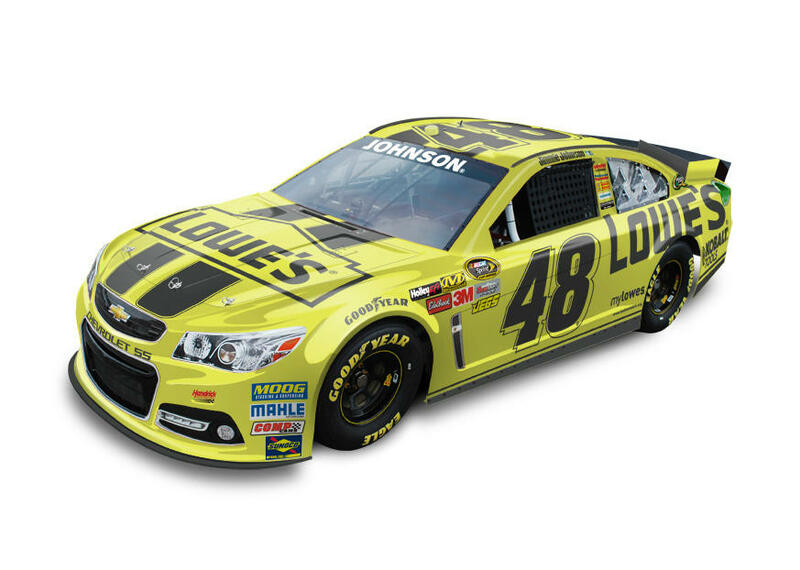 Fans also will be among the first to see the new sixth-generation NASCAR Sprint Cup Series cars and 2013 paint schemes. NASCAR Acceleration Weekend also features the 2013 NASCAR Hall of Fame Induction Ceremony, held at the Charlotte Convention Center Friday, Feb. 8. Fans can be part of history as five NASCAR legends – Buck Baker, Cotton Owens, Herb Thomas, Rusty Wallace and Leonard Wood – are enshrined into the NASCAR Hall of Fame. Tickets for the Induction Ceremony start at $45. Acceleration Weekend wraps up Sunday, Feb. 10 with the unveiling of the new NASCAR Hall of Fame inductees’ granite markers in the Ceremonial Plaza. Jeff Burton Autosports, Inc., and Robbie Stanley Racing, Inc., announced today that the two entities have partnered to create an easier way for families to get started in the sport of quarter midget racing. 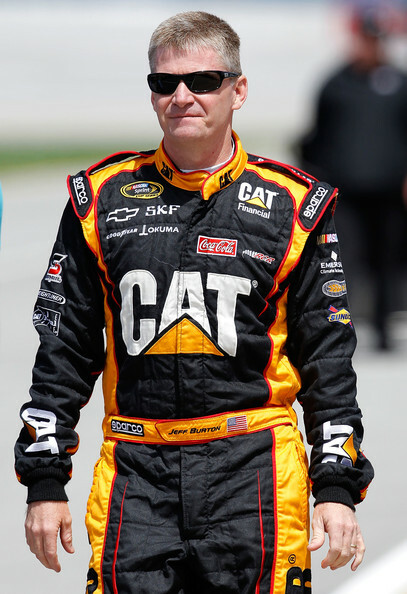 The new alliance brings together Jeff Burton, a noted successful NASCAR Sprint Cup Series driver who has been a part of many technological advances in NASCAR, and Ryan and Ron Stanley, respected leaders in innovation and supporters in the quarter midget world since 1977. The goal of the new "Robbie Stanley Racing" joint venture is to provide youngsters a simple, easy and effortless way to compete in quarter midget racing, and to provide easy access to state-of-the-art quarter midget race cars and the very best, ground-breaking products at affordable pricing. "I have a huge passion for quarter midget racing," said Burton, whose 12-year-old son Harrison has competed in the open-wheel series since he was five. "We want to expose the sport to families and let them try it out. We are going to have the best original parts, the best service, the best pricing, and we will make it easier for beginners to get started in the sport, and help the ones at the top of their game become better. "Ryan and Ron have the best reputation of anyone in the sport. Ask any family who has ever needed help at the track, and they will tell you that the Stanleys are always willing to lend a hand. We all want to educate people about a sport that is a 'best kept secret.'" 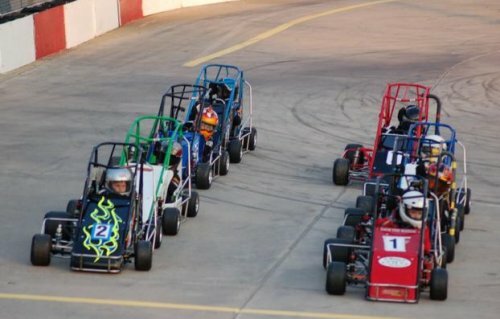 Quarter midget racing has been around for more than 50 years. Both USAC (United States Auto Club) and QMA (Quarter Midgets of America) sanction many race tracks (1/20 mile ovals) across the country. The series allows families to spend time together, and the young drivers (5 to 16 years old) help work on the race cars (1/4 the size of full-size midget cars) and see what it takes to be successful. They learn skills and sportsmanship, providing lessons in life. Get your kid in a Quarter Midget! "That is why we are going to make it easy for racers to find whatever parts and pieces they need. We want the sport to continue to grow nationwide, and for other families to see what they are missing," said Ryan Stanley of RSR, which is based in Concord, NC. "We will completely upgrade to a state-of-the-art website (www.robbiestanleyracing.com) to make it simple for customers to get the items they need quickly and in an efficient way. We also have dealers across the country who will carry our products as well. "Jeff has seen motorsports from pretty much every aspect. He built race cars as a youngster and has driven for nearly 40 years. His knowledge of technology used at the NASCAR Sprint Cup Series level only helps us. We will be able to learn from his experience, his expertise, vision and desire to be the best. This partnership will help take us to the next level." The website is being revamped so that anyone can easily maneuver their way on the site to find the items they are in need of. In addition to showcasing hard-to-find products, the web will also showcase tutorials to educate the novice on the specifics of quarter midget race cars. There will also be additional education videos to assist each customer. The new Robbie Stanley Racing will serve as an outlet for anything related to quarter midgets and will offer "exclusive" items that won't be able to be purchased anywhere else. Inventory will be large, offering more parts and pieces with the best prices. "We want to see the sport grow," said Ron Stanley, Ryan's father, who started the business. "Seems like we have been in business forever and we have always tried to do the right thing with our customers. We certainly have good intentions with this endeavor. "Jeff has some great ideas, and knows a lot of people throughout all forms of motorsports. He will be able to help us get in new doors to ultimately help make our sport better. He knows and understands what families need to be in quarter midget racing. He brings a technological savvy to our organization. We have some great things coming down the pipe." Many recognizable names in motorsports today got their start in quarter midget racing. Some include: NASCAR Champions' Jeff Gordon, Terry and Bobby Labonte, and this year's titlist Brad Keselowski, along with legendary, four-time Indy 500 winner A. J. Foyt and 1996 Indy Car Series Champion Jimmy Vasser. A quarter midget car is a scaled-down version of an actual midget racer, approximately ¼ scale. The cars are built around a tubular frame and are fully suspended with springs or torsion bars and shocks. The bodies are fiberglass and the driver is surrounded by roll cage and nerf bars. To learn more about how to get involved in quarter midget racing, contact the new Robbie Stanley Racing via website at www.robbiestanleyracing.com, or by phone at (704)-STANLEY (782-6539). 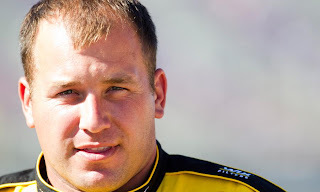 Members of the National Motorsports Press Association have selected NASCAR Sprint Cup driver Ryan Newman as the fourth quarter winner of the NMPA Speedway Motorsports Spirit Award. The award is designed to recognize character and achievement in the face of adversity, sportsmanship and contributions to motorsports. Each year, quarterly winners are selected, and an overall winner is determined by a vote of the National Motorsports Press Association membership. Newman was recognized for hosting the 8th Annual Charity Dinner and Auction and annual fishing tournament in December, raising funds for animal welfare, education and conservation efforts. The evening featured entertainment from Nashville singer/songwriters and NASCAR drivers and raised more than $340,000. Newman helped raise awareness of a memorial fund after crewman Andy Rueger lost his son in an ATV accident on Nov. 22. Clint Bowyer, Rockingham Speedway President Andy Hillenburg and Brad Keselowski are also quarterly winners this year. The 2012 winner will be announced on Jan. 20. Also receiving votes were: Jimmie Johnson, Kevin Harvick, Kurt Busch, Texas Motor Speedway and Martin Truex Jr.
Kyle Busch Motorsports announced today that veteran crew chief Harold Holly has joined the organization to lead Joey Coulter in his quest for the 2013 NASCAR Camping World Truck Series championship. 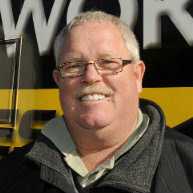 Additionally, the team announced that Coulter will pilot the team's flagship truck, the No. 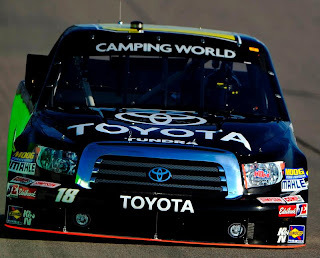 18 Tundra, while team owner Kyle Busch will run a partial schedule in the team's second entry, the No. 51 Tundra. Busch's schedule and the rest of the team’s driver lineup will be announced at a later date. With Holly calling the shots, Coulter earned his first Truck Series win at Pocono Raceway in August of last season for Richard Childress Racing, while also capturing three pole awards. Coulter also posted eight Top-5 and 15 Top-10 finishes en route to a third-place finish in the championship standings. Coulter's 749 driver's points accumulated over the final 20 races this season were more than any other Truck Series driver during that span. Overall, in two Truck Series seasons together, the tandem accumulated one win, 14 Top-5 and 28 Top-10 finishes in 47 starts, along with one Top-10 finish in two Nationwide Series starts. 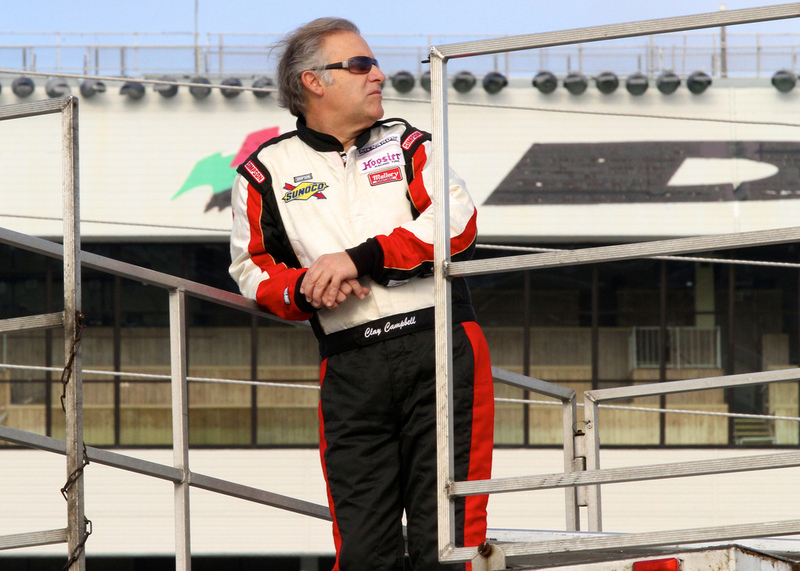 Holly also served as the crew chief for Coulter's two full-time seasons in the ARCA Racing Series, in 2009 and 2010. "Being able to join Kyle Busch Motorsports and continue to help Joey grow at the same time is a pretty special thing," said Holly, who will begin his fifth consecutive season as Coulter's crew chief. "Kyle brings a lot to the sport and a lot to the Truck Series, so I'm looking forward to the opportunity to work for his organization. Joey and I have spent the last couple years learning this series and what it takes to points race with these guys. We've gotten better each year and I think we have a good plan going into next season. The biggest thing is that we need to come out of Daytona with a solid finish. Last year, we got so far behind at the beginning and had to make up so much ground at the end." "When we signed Joey, we made a promise to him that we would do everything that we possibly can to put him in a position to win the championship in 2013 and we made bringing in Harold Holly as his crew chief our top priority this offseason," KBM General Manager Rick Ren said. "After we signed Joey in early November, I listened to some of their radio communication during practice those last few races and they really work well together. With having such a short schedule in the Truck Series, you can't afford to get off to a slow start and we feel like this move will help ease the transition of moving to a new organization for a young driver." A fixture in the Nationwide Series garage during the late 1990's and 2000's, Holly led Jeff Green to the 2000 series championship. Green collected six wins, seven poles, 25 Top-5 and 27 Top-10 finishes in 32 starts en route to the crown. Coulter and Holly will make their KBM debut Feb. 22 in the season-opening NextEra Energy Resources 250 at Daytona (Fla.) International Speedway. NASCAR Nationwide Series Director Joe Balash and Camping World Truck Series Director Wayne Auton are the beneficiaries of pre-holiday promotions today. Auton has been named by the sanctioning body to head-up the NASCAR Nationwide Series, effective immediately. been a part of the NASCAR scene for decades. He is the son of longtime NASCAR official Robert "Hoot" Auton, who oversaw events from the short tracks to the NASCAR Sprint Cup Series for more than 37 years prior to his passing in February of 2009. 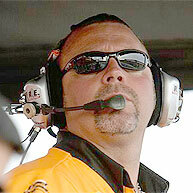 Auton replaces Balash, who has served as the NASCAR Nationwide Series Director since 2004. He will assume a new role as International Competition Liaison, serving as NASCAR’s point of contact for competition-related matters on the NASCAR Toyota Mexico Series, NASCAR Canadian Tire Series, the Euro Racecar NASCAR Touring Series and other international series with which NASCAR may be involved and/or considering involvement. Former NASCAR Sprint Cup Series competitor Chad Little will replace Auton at the helm of the Camping World Truck Series, after heading the NASCAR Mexico and NASCAR Whelen Modified Tours in recent seasons. Little won six races in what is now the NASCAR Nationwide Series between 1992 and 2002, with a top championship finish of second in 1995. He also made 217 career Sprint Cup Series starts over a 16-year career, driving for car owners Chuck Little, Cale Yarborough, Harry Melling, Greg Pollex and Jack Roush. George Silbermann, NASCAR vice president regional and touring, highlighted the fact that these moves will aid NASCAR as it continues to focus on expanding its reach beyond the United States. South Carolina's McCall Farms will return to the No. 34 Ford of David Ragan for four races in the 2013 NASCAR Sprint Cup Series for the second consecutive season. 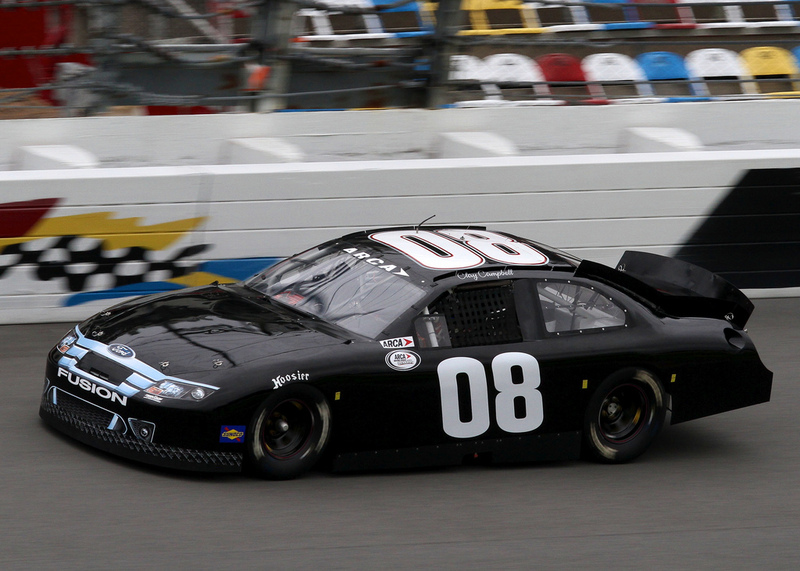 After first joining Front Row Motorsports in May 2012 at Darlington (S.C.) Raceway, McCall Farms returned to the No. 34 car for additional races at Bristol (Tenn.) Motor Speedway, Atlanta (Ga.) Motor Speedway and Charlotte (N.C.) Motor Speedway. The company's Margaret Holmes Peanut Patch brand will serve as the primary sponsor of the Front Row Motorsports entry at the same four venues in 2013. The Peanut Patch Ford will make its 2013 debut just miles from McCall Farms' Effingham, S.C., headquarters in the May 11 race in Darlington. Peanut Patch will also adorn the car at Bristol on Aug. 24, Atlanta on Sept. 1 and Charlotte on Oct. 12. "Boiled peanuts have long been known as the South's favorite snack," said Woody Swink, a representative of the fifth-generation family company. "We're very pleased to be continuing our relationship with Front Row Motorsports and David Ragan. "What better fit for a fifth-generation family-run company, marketing a snack that has been a southern tradition for many years, than by sponsoring a second-generation driver from South Georgia in races at four of NASCAR's most historic and entertaining venues?" 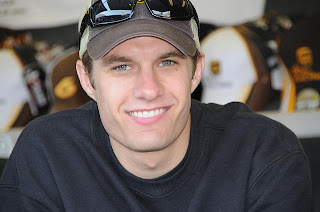 David Ragan said he is happy to welcome Peanut Patch back to the No. 34 team. "Having grown up in South Georgia, I've been eating boiled peanuts my whole life," Ragan said. 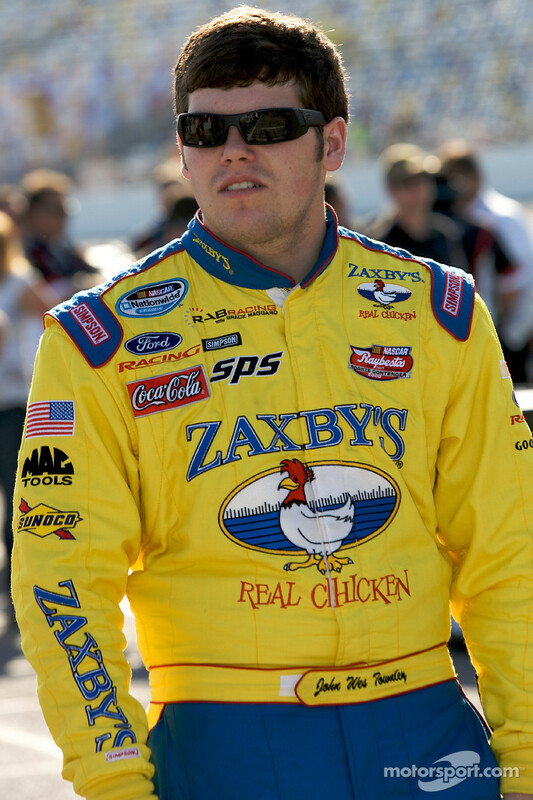 "McCall Farms has been a great partner for Front Row Motorsports and I'm happy to be representing the Peanut Patch brand for the second consecutive year in 2013." 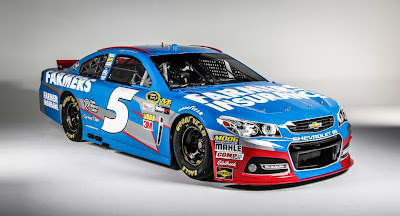 "McCall Farms and Peanut Patch are a great example of a partnership that gets great value working with Front Row Motorsports," commented the team's marketing director, Mike Laheta. "They do a great job of taking their sponsorship to the consumer at the retail level and getting results. We're happy to have them back in 2013 and help them get great exposure once again." Roush Fenway Racing’s No. 6 Ford Mustang will have a familiar look when Trevor Bayne takes the reins of the NASCAR Nationwide Series championship team in 2013. The organization announced today that Cargill will return as a partial-season primary sponsor next year, beginning with the season opener at Daytona International Speedway. Crew chief Mike Kelley will return to lead the team. 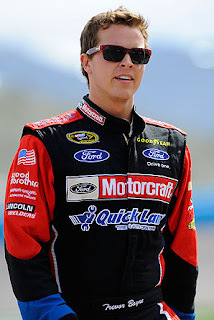 “I’m really excited about the opportunity to work with Mike and this team and run for the Nationwide Series Championship in 2013,” said Bayne, who in 2010 became the youngest winner of the famed Daytona 500. “And it’s great to have Cargill Beef back on board with the No. 6 next season. I’ve enjoyed learning about their business and meeting a lot of their people through their partnership with Roush Fenway, and I look forward to representing them on the track and hopefully in Victory Lane. Red Horse Racing confirmed today what GodfatherMotorsports.com first reported on November 21, that John Wes Townley will join the team in 2013 to drive the No. 7 Red Horse Racing Toyota Tundra. The truck will carry primary sponsorship from Zaxby's for the 22-race NASCAR Camping World Truck Series season. After competing for Rookie of the Year honors in 2012 and collecting his career-best series finish of eighth at Pocono Raceway, Townley enters his second full-time season credited with 28 total starts. "I'm a competitive race car driver, and I want to race and compete for wins," said the 22-year old Georgia resident. "Red Horse Racing has worked hard and continues to excel in the truck series. The success that this Red Horse Racing organization was able to accomplish last season, is the same success we are looking forward to next year." Veteran crew chief Mike Beam will join John Wes Townley at Red Horse Racing on the No. 7 Toyota Tundra. Beam has been atop the pit box since the early 80's and is credited with 25 national series victories. "The Truck Series proved to be the most competitive series in 2012, said Beam. "I want to be a part of that, and be a part of one of the top-tiered teams in the series. Playing an integral part in John's career is important to me and I'm anxious to see our results." Team Principal, Tom DeLoach said of the signing, "John showed vast improvement on the track this past season. Red Horse Racing is eager to move him to the next level in his racing career. Pairing him with Mike Beam is a great way to give John the insight from Mike's impressive background. We had a fantastic 2012 season and we are anxious to see what 2013 will hold." Nielsen and Twitter have announced an exclusive multi-year agreement to create the “Nielsen Twitter TV Rating” for the US market. Under this agreement, Nielsen and Twitter will deliver a syndicated-standard measurement of the reach of the TV conversations on Twitter, slated for commercial availability at the start of the fall 2013 TV season. TV viewers discuss TV on Twitter, creating a new dynamic between audiences and programming. The service’s more than 140 million active users send one billion Tweets every two and a half days, the vast majority of which is public and conversational, making Twitter data a necessity in producing standardized metrics representing online and mobile conversations about television. The Nielsen Twitter TV Rating will compliment Nielsen’s existing TV ratings, giving TV networks and advertisers real-time metrics to understand TV audience social activity. “The proliferation of smartphones and tablets has generated a substantial ‘connected’ TV audience that is simultaneously watching television and accessing the Internet through these devices. This, in turn, will continue to create the opportunity for content providers like CBS to offer engaging interactive features for our viewers. As this form of viewer engagement evolves into a mainstream activity, it presents ways for CBS to enhance the viewing experience for our viewers and our advertisers. We are already engaged with Nielsen and Twitter in a program of research and experimentation in this exciting new area,” said David F. Poltrack, Chief Research Officer, CBS Corporation. “We are pleased to see Nielsen and Twitter join together to provide a comprehensive measurement system that will allow us to employ these social networking tools to their full advantage." SocialGuide, recently acquired by Nielsen and NM Incite, currently captures Twitter TV activity for all U.S. programming across 234 TV channels in English and Spanish, and more than 36,000 programs. Through a sophisticated classification process, SocialGuide matches Tweets to TV programs to offer key social TV metrics including the number of unique Tweets associated with a given program and rankings for the most social TV programs. Jimmie Johnson will drive a yellow Lowe's/Jimmie Johnson Foundation Chevy SS in some events next season. 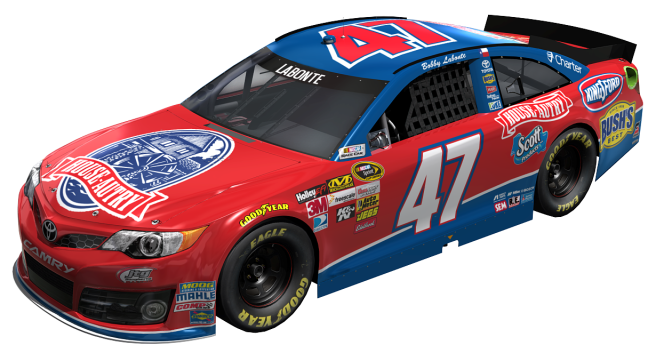 Bobby Labonte's new House Autry Toyota out of the JTG Daugherty Racing shops. Austin Dillon will wheel this sharp Advocare Camaro in 2013 Nationwide action. Kasey Kahne's 2013 Farmers Insurance Chevrolet. Joey Logano debuted his No. 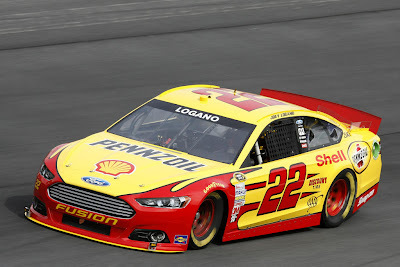 22 Shell Pennzoil Ford at Daytona last week. Photos: Shell Racing US, Lionel NASCAR, JTG Daugherty Racing, Hendrick Motorsports. For NASCAR fans who have been eagerly counting the days to the opening of the 2013 season, their wait is almost over. For the second-consecutive year, reigning NASCAR Sprint Cup Series champion Brad Keselowski, five-time champ Jimmie Johnson and NASCAR’s most popular driver, Dale Earnhardt Jr., will help race fans celebrate the past, present and future of NASCAR. The return of NASCAR Acceleration Weekend – a fan-friendly, interactive experience – is scheduled for Feb. 8-10, 2013, at the Charlotte (N.C.) Convention Center and includes the 2013 NASCAR Hall of Fame Induction Ceremony and NASCAR Preview 2013. NASCAR Acceleration Weekend tickets are on sale now at www.nascaracceleration.com and the NASCAR Hall of Fame box office. Tickets for Friday night’s Induction Ceremony start at $45. In addition, a $20 ticket will gain fans all-day access into NASCAR Preview 2013 and the NASCAR Hall of Fame on Saturday, February 9. More than 50 drivers across NASCAR’s three national series – NASCAR Sprint Cup, NASCAR Nationwide and NASCAR Camping World Truck Series – are scheduled to participate in the all-day NASCAR Preview 2013 event. Fans will have the opportunity to interact with drivers and secure autographs, participate in driver Q&A sessions, get a first-look at the new sixth-generation NASCAR Sprint Cup Series race cars and paint schemes and check out various interactive displays, among other activities. The weekend’s activities begin Friday, February 8, with the 2013 NASCAR Hall of Fame Induction Ceremony. The five inductees are Buck Baker, Cotton Owens, Herb Thomas, Rusty Wallace and Leonard Wood. Legendary broadcasters Ken Squier and Barney Hall will also be honored with the inaugural Squier-Hall Award for Media Excellence for their significant contributions to the success of NASCAR during their distinguished careers as media members covering the sport. The following day, Saturday, February 9, NASCAR Preview 2013 begins at 7 a.m. in the Charlotte Convention Center. Similar to last year’s event, the all-day fan festival will feature autograph and on-stage Q&A sessions by top drivers from all three national series, the new sixth-generation NASCAR Sprint Cup cars and paint schemes, giveaways and activities for fans of all ages. Among other marquee names scheduled to participate are four-time series champion Jeff Gordon, three-time series champion Tony Stewart, two-time NASCAR Nationwide Series champion Ricky Stenhouse Jr., reigning NASCAR Nationwide Series most popular driver Danica Patrick, and 2012 NASCAR Camping World Truck Series champion James Buescher. Also on Saturday, February 9, the newly inducted NASCAR Hall of Fame members and/or their family representatives will be on hand for the unveiling of their Hall of Honor exhibits commemorating their NASCAR careers. On Sunday, February 10, each inductee’s granite marker will be unveiled in the Ceremonial Plaza as well as other exclusive member-only events. More than 500 people enjoyed a day of holiday cheer at Sonoma Raceway Saturday at the 8th Annual Race to the Holidays Christmas Party. 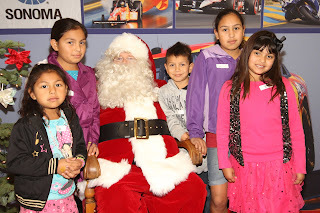 The raceway hosted more than 230 Sonoma Valley children and their families at the event, which featured caroling, refreshments, a car display, balloon animals and a visit from Santa Claus, who arrived via special transportation on a Schell-Vista Fire Department fire truck. The event, which has attracted more than 1,800 children since its inception in 2005, culminated with Santa Claus presenting each child with a bag full of toys. Children ranged in age from newborn to 12-years-old. The festive event was held under cloudy skies, but all of the children left the raceway with new toys and wide smiles. Following the toy distribution, everyone was treated to a free lunch at the Raceway Café. All children who attended the party were pre-registered through six Sonoma Valley youth groups, including: Friends in Sonoma Helping; La Luz Center; Sonoma Valley High School Teen Parent Program; Valley of the Moon Boys and Girls Club; Sonoma Valley Mentoring Alliance; and theWillMar Family Grief and Healing Center. The raceway received a generous outpouring of support from the community as more than 700 toys were donated for the party. Some of the drop-off locations included: Sonoma Valley Index Tribune; Sonoma Valley Sun; Gundlach-Bundschu Winery; Schell-Vista Fire Department; Sonoma Valley Chamber of Commerce; the Sonoma Valley Fire Department; and Redwood Credit Union. The raceway also received toy donations from United Site Services and the Sonoma Valley Mother’s Club, as well as toothbrushes and toothpaste for each child from the American Red Cross. Approximately 50 drivers conducted a three-day ARCA Racing Series test session this weekend at Daytona International Speedway, in advance of the 50th annual Lucas Oil Slick Mist 200 on Saturday, Feb. 16, part of Budweiser Speedweeks 2013. 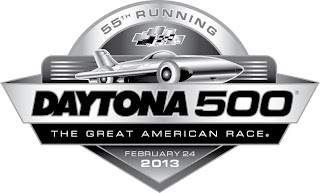 The season-opening ARCA race will celebrate its golden anniversary in 2013. The inaugural Daytona event in 1964 was the series’ first-ever superspeedway race, and headlining the list of drivers in attendance for the test was the defending race winner Bobby Gerhart, a native of Lebanon, Penn., who has dominated the season-opening race with a record eight victories, including six of the last eight. Gerhart also holds an event-record four poles, but even with that past success, he is hungry to win a ninth Lucas Oil Slick Mist 200. Light rain slowed Friday’s morning session, but teams got plenty of track time in the afternoon. At the lunch break, Gerhart was anxious to see where the field stood in terms of speed. Clay Campbell, president of Martinsville Speedway made his first laps around Daytona International Speedway during the weekend test, driving a Spraker Racing Ford with a Roush Yates engine. “I’ve been doing various types of racing for 20 years and if you had the opportunity to do something bigger, I think anybody would jump at the chance,” said Campbell, who plans to enter the Lucas Oil Slick Mist 200. “Anybody that would have the opportunity to run Daytona, you would be crazy not to. The history, the tradition, this is the ultimate as far as motorsports goes. Campbell is working with racing veteran Jeff Spraker, who has been fielding cars for Campbell the past two seasons in the NASCAR K&N Pro East Series. Campbell competed in the fall ARCA event at Talladega Superspeedway and is ready to tackle Daytona in February. Newcomers Johnny VanDoorn, Travis Braden, Jonathan Eilen and Dakota Carlson also participated in the weekend test session, after earning spots in the second-year "Road to Daytona" program. “It was pretty cool just to say some day that I got to go around Daytona,” said Carlson after his initial laps Friday. “As short track racers, we’re never going to make it to this level more than likely. It definitely sits you down in the seat when you go into the corner. The “Road to Daytona” program gives competitors from nearly all divisions of ARCA competition an opportunity for seat time at Daytona. Coopersville, Mich., native VanDoorn, 24, is a0 three-time ARCA CRA Super Series champion and won the 2012 title for Kaos Motorsports. Braden, an 18-year old West Virginia resident, was the circuit’s 2012 Super Series Rookie of the Year. Minnesota’s Eilen, 27, won the 2012 Midwest Tour championship, five years after becoming the series' first race winner. Carlson won the ARCA Gold Cup Series championship, contested at Toledo and Flat Rock Speedways, as well as Spartan (Mich.) Speedway. Two-time Daytona winner and the 1995 ARCA champion Andy Hillenburg assisted the Road to Daytona drivers this weekend, and his Fast Track High Performance Driving School provided cars and support for the test. AT LAST: MadCan's Famous "Egg Nog French Toast"
Check Out Some Of The New 2013 Paint Schemes! Want To Be An All-Star? Here's How!